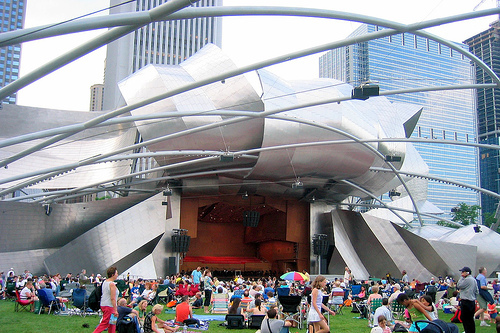 Amid the chaos of preparing for a shortened, ticketed, less musical Taste of Chicago in Grant Park and a Mike Orlove-free future at Millennium Park, Chicago’s cultural minions have announced some of this summer’s musical acts. Home girl Jennifer Hudson will headline Taste at 5:30 p.m. on July 11 with an opener to be determined; Death Cab for Cutie will do the same at 5:30 p.m. on July 12; Chaka Khan will perform on July 14 after an opening set by the great Raphael Saadiq at 5:30 p.m., and Dierks Bentley and Lindi Ortega will play starting at 3:30 p.m. on July 15. Holes in the schedule still include July 13 and an early show sponsored by Radio Disney on July 14. Meanwhile, Millennium Park will offer a much more enticing roster of free music thanks in part to Pitchfork Music Festival promoter Mike Reed, who has worked with Orlove on New Music Mondays and other programs over the last few years, and who has tried to fill some of the gap left by his recent departure. In addition to the New Music Mondays/Downtown Sound series, this year introduces a new electronica program called Loops and Variations. But the popular Music Without Borders world music series has been axed (with supporters organizing a petition to bring it back here, and so far collecting 487 signatures). New Music Mondays at Millennium Park start at 6:30 p.m. and include Kelly Hogan and Scott Lucas and the Married Men (May 28); Jonathan Richman and Joel Paterson and the Modern Sounds (June 4); the Eternals and Wild Belle (June 11); Cloud Cult and Judson Claiborne (June 18); Occidental Brothers Dance Band International and Chico Trujillo (June 15); Joan of Arc and Daniel Knox (July 2); the Sadies and James Vincent McMorrow (July 9); Charles Bradley and His Extraordinaires and Abigail Washburn (July 16); Ana Tijoux and Sidi Touré (July 23), and SMOD and M.A.K.U. Soundsystem (July 30). The Loops and Variations shows start at 6:30 p.m. on Thursdays and feature Chris Clark, Jan Jelinek and Andrew Pekler and Casino Versus Japan (June 7); Deerhoof and Ensemble Dal Niente (June 14); eighth blackbird (June 28); A Winged Victory for the Sullen and American Contemporary Music Ensemble (July 5), and Third Coast Percussion (July 12).